In the Name of Allah, the Most Merciful, the Compassionate.All praise is due to Allah Lord of the Worlds. 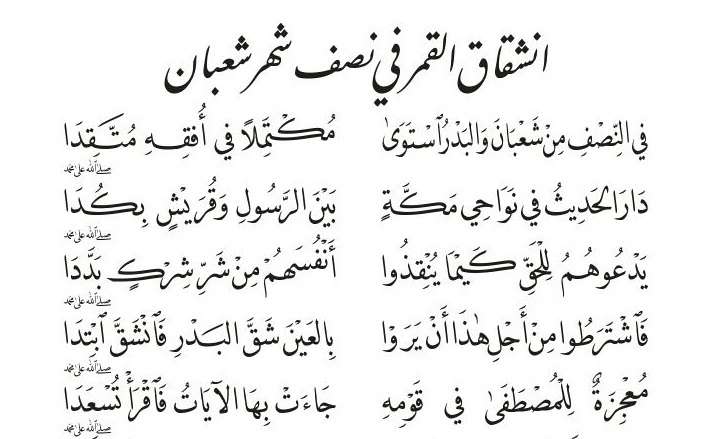 O Allah, bestow peace and blessings upon our Master Muhammad and upon his Family and Companions. O Allah, the Bestower of favours. No one has favour over You. O Possessor of Majesty and Nobility, the One Who constantly bestows His bounties. There is no god but You, the One who grants safety and refuge to those that seek it and to those in fear. O Allah, if You have recorded us as being wretched, deprived, cast out or if You have recorded that our provision be restricted then erase this by Your bounty. Instead record us in “the Mother of the Book” as being felicitous, as having plentiful provision and grant us the ability to do good works. Truly You have said, and Your word is true, in Your revealed Book, on the tongue of Your Prophet: Allah erases and confirms what He wishes and with Him is the Mother of the Book. O Allah, through Your most mighty manifestation on the fifteenth night of Sha`ban the Ennobled, in which every decreed affair becomes distinct and unchangeable, we ask You to remove all tribulations, those that we know and those that we do not know and those about which You know more, truly You are the Most Mighty, the Most Generous.